"Adopting Mamas and her litter of four kittens is one of the best decisions I have ever made. A wonderful experience." Hitch has a club foot and was rescued from a dumpster. Elsa is a rescued Bernese Mountain Dog. 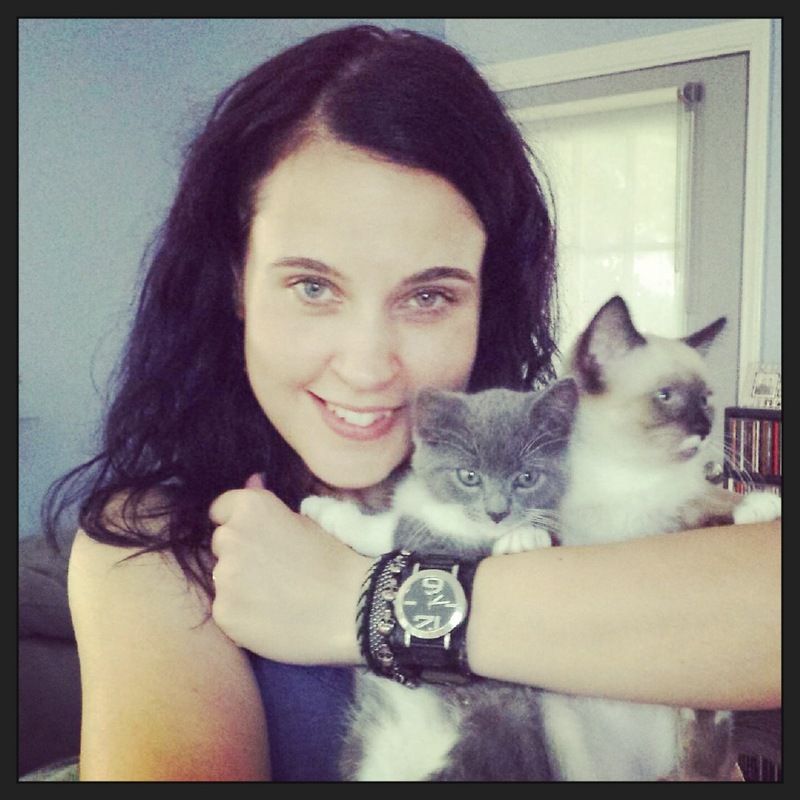 Ingrid with Soren and Willow as babies. 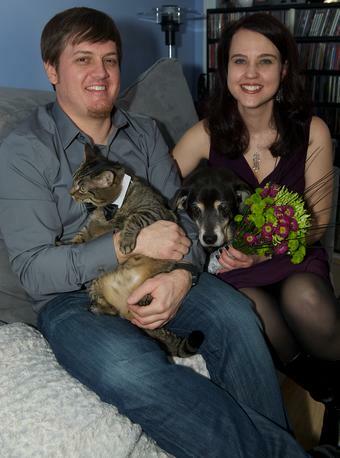 Husband Jake, Hitch their cat with a club foot found at a gas station and "hitched" a ride, Maple their first dog just a month before she passed and Ingrid. Ingrid Johnson is a Certified Cat Behavior Consultant (CCBC) through The International Association of Animal Behavior Consultants (IAABC). She is past Co-Chair of the Cat Division as well. Ingrid is employed at Paws Whiskers and Claws, a feline only veterinary hospital in Marietta, Georgia, as a veterinary technician and cat groomer. 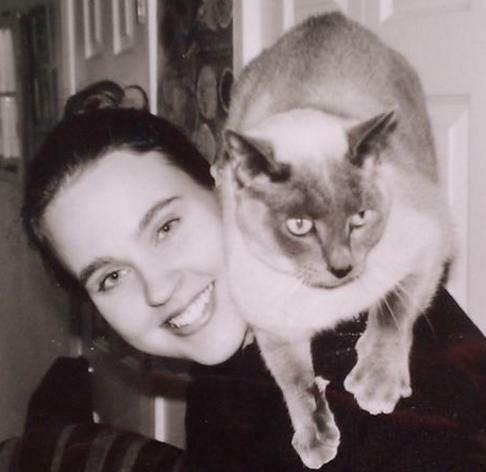 Ingrid has been working exclusively with cats since 1999 and has had the opportunity to attend many continuing education courses all over the country, including the first ever all-cat behavior conference hosted by the American Association of Feline Practitioners (AAFP). She has now moved on to speaking at the AAFP! 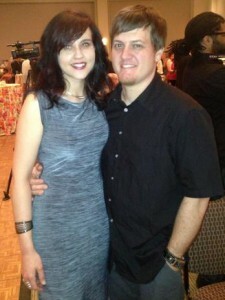 Ingrid also created another website resource with friend and colleague Mikel Delgado called foodpuzzlesforcats.com. This site is the one stop resource for all things food puzzles one of Ingrid's most passionate topics regarding cat care. 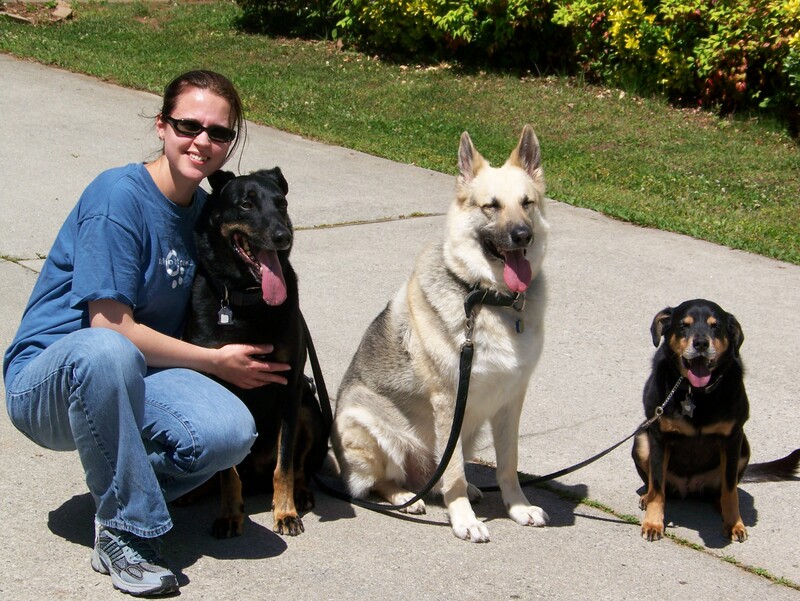 She lectures at veterinary conferences such as the Atlantic Coast Veterinary Conference (ACVC.org) and the AAFP as mentioned above, to both veterinarians and technicians, but will also offer staff and volunteer education for shelters and rescues in the Atlanta area. She has spoken at different humane society events on common cat behavior challenges, hosted group education seminars for the volunteers at Good Mews, and also hosted discussions for her colleagues through the IAABC on her most passionate topic, environmental enrichment for indoor cats. Most recently she has been appointed Co-Director of the Paw Project Georgia chapter, working towards ending the cruel practice of de-clawing cats. Ingrid and husband Jake Egolf, the man behind the vertical space and scratching posts, at the Furkids 11th anniversary celebration May, 2013. Ingrid has been interviewed for numerous publications both in print and online including Cat Fancy magazine, Catster, thedailycat.com, Critter Chatter, and The Atlanta Journal Constitution. The AJC also utilized Ingrid’s feline knowledge to answer an online question and answer column called “Ask the Experts” at AJCpets.com. Ingrid’s home was featured in Cat Fancy magazine’s 2008 “Home Issue” showcasing all of the feline friendly accommodations that she and her husband have made to their home. This spread illustrates many of the aesthetically pleasing ways you can provide for your cats' innate basic needs while still having a home the humans can enjoy and be proud to show off. Perhaps one of the most exciting opportunities was when her home, cats, and environmental enrichment expertise were featured on Animal Planet’s Cats101 show, specifically the episode featuring the Color-Point Short Hair. You may also catch clips of her feline family in the Animal Planet’s Must Love Cats theme song and on various other programs. Ingrid is also a blog writer for the IAABC’s Cat blog, www.iaabc.org. Ingrid was featured on Animal Planet's Cats101, the episode showcasing the Colorpoint Shorthair. The focus of the show was not only to highlight all of her beautiful rescued Colorpoint cats, but also to spotlight all of the feline friendly accomodations that she has made to her home. The episode discusses environmental enrichment, feline foraging toys, and the 100% sisal scratching posts made by her husband, Jake. This one hour webinar features both the No Bowl feeding system and it's creator Dr. Liz Bales as well as Ingrid's enrichment expertise detailing a condensed version of her Environmental Enrichment for Indoor Cats lecture. Both presentations as as well as a Q and A session are available here. Ingrid was asked to participate in some educational videos produced by the website WebMD. This video discusses the management, treatment and prevention of hairballs. This clip is a MUST WATCH for every cat parent, it highlights proper litter box maintenance! Ingrid brought her passion for environmental enrichment to the radio talk show scene when she was interviewed on Pet Life Radio with host and pet authority Amy Shojai. Easy solutions to meet your cat’s needs so that everyone in the household is happy. I offer suggestions on maximizing your litter box protocol. Ingrid wrote this piece, "Environmental enrichment to decrease aggression in multi-cat households" to compliment the title article and this segment is inserted on page two. Cat Headbutting: What Does It mean?, April 2016, Pet M.D. Ingrid offered her thoughts on this affectionate feline behavior. Ingrid offers her expertise in the realm of feline foraging once again. This article discusses the importance of cats eating a carnivorous diet as well as working for their food via food puzzles. 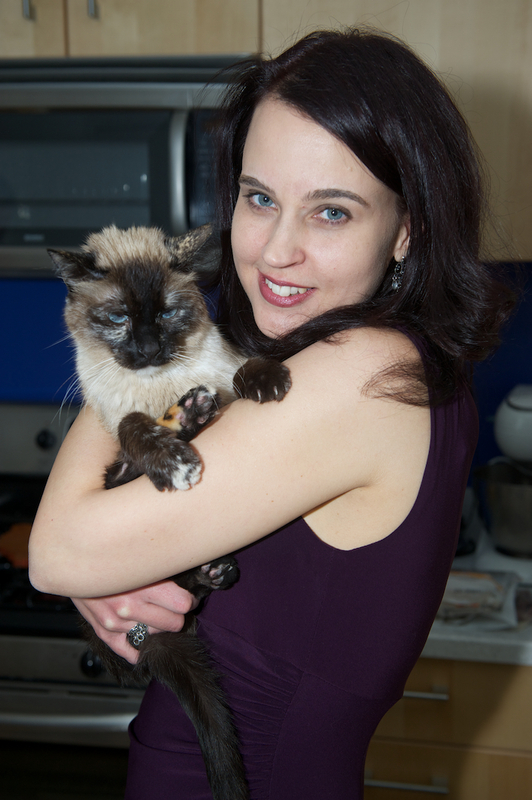 Ingrid was interviewed for her expertise on how to help a shy cat feel more comfortable and come out of their shell. Helping Clients Understand Feline Behaviors, June 2012, Techniques-Colorado Association of Certified Veterinary Technicians newsletter. Ingrid wrote this article to help staff in the veterinary community better understand normal cat behavior so that technicians can more effectively educate pet owners about the behaviors their cats are engaging in. Ingrid suggested ideas for keeping your cat occupied so that sleep patterns, etc. are not disturbed. Ingrid offered advice on how to encourage cats to play and finding a toy they prefer. This article highlighted Ingrid’s expertise in feline environmental enrichment. This article discusses how to maintain harmony between cats in a multi-cat household. 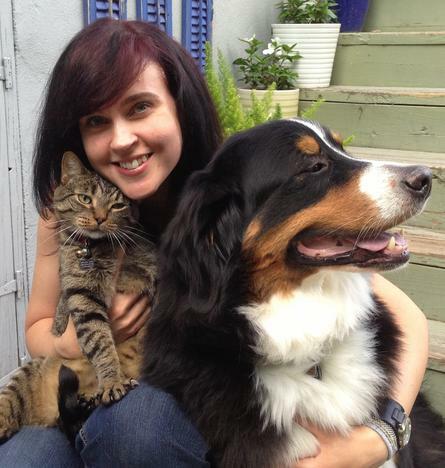 Ingrid was interviewed for her expertise on her most passionate topic, foraging toys for cats. Ingrid’s home and cats were featured in this article highlighting all of the feline friendly accommodations she has made to her home. The focus was keeping one’s home décor fashionable while still appropriately providing for your cats’ needs. This is one of Ingrid’s niches. This article focused on environmental enrichment, the importance of vertical space and feline foraging toys. Ingrid’s home was once again the feature and all photos were taken in her home. This article touched on some of the most basic behavior concerns the average cat parent encounters and how to address them. Ingrid and her cat Mercury were featured in this article that discussed the need for behavioral modification medications to help improve a cats’ ability to cope with stress in the home.